SSAS is a Microsoft analytical solution. It began strictly as an OLAP solution, but it now has multiple modes. SSAS can be used as a semantic layer that supports both formatted reports and managed self-service BI scenarios. Client tools connect to SSAS databases through OLE DB or ADOMD providers. From SSAS 2012 through SSAS 2016, there are 3 available modes: Multidimensional, Tabular, and Power Pivot for SharePoint. Both multidimensional and tabular modes have the ability to store the source data in the model and process it periodically, or directly query the data from the source. Directly accessing the source data is called ROLAP in multidimensional mode and Direct Query in Tabular mode. 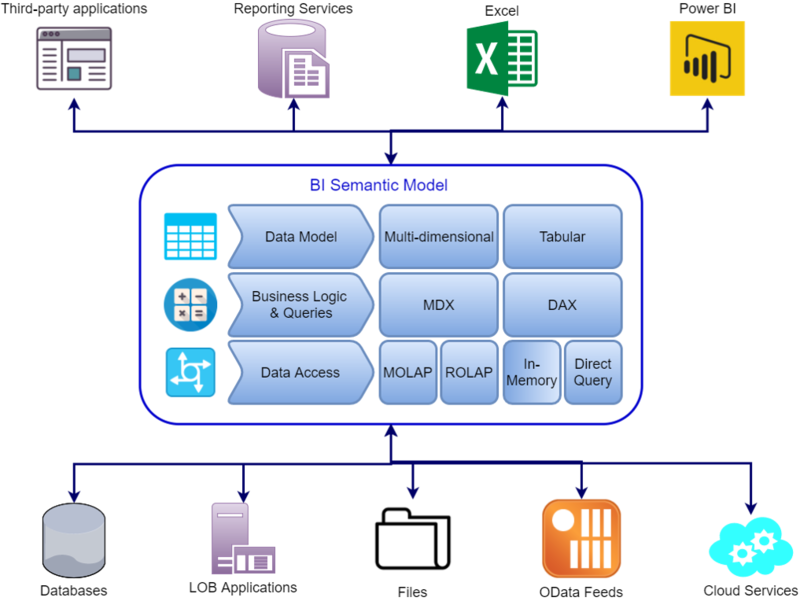 Multidimensional SSAS is seen as as a more mature, traditional corporate BI solution. It uses an OLAP engine and requires a well formed star schema data model to work optimally. MDX is used to query the SSAS cube and XMLA is use to define, deploy, update, and process the cube. Tabular SSAS was introduced with SSAS 2012. It uses an in-memory xVelocity engine. DAX is the native query language, although MDX can be used and the SSAS engine will translate it to DAX. From compatibility level 1200 forward, TMSL (Tabular Model Scripting Language) is JSON that is used to define and process the tabular model. Tabular SSAS solutions on compatibility level 1100 and 1103 use XMLA. Detailed instructions on getting ssas set up or installed.